SCE Simple Shape displays very basic objects. 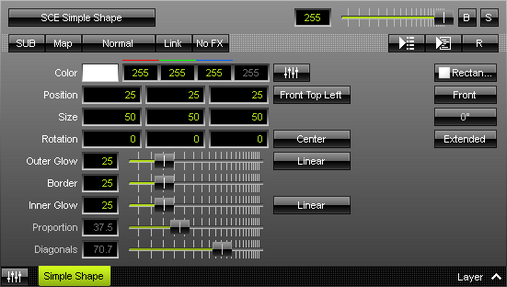 This effect is particularly useful for 3D or in combination with other Layers and Mix Modes. ▪ Position - Defines the position of the object in X, Y, and Z [in %]. The default values are 25, 25, 25. Valid values range from -1000 to 1000. ▪ Size - Defines the size of objects [Width, Height, Depth] [in %]. The default values are 50, 50, 50. Valid values range from 0.01 to 1000. ▪ Rotation - Defines the rotation of objects in X, Y, and Z [in °]. The default values are 0, 0, 0. Valid values range from -180 to 180. ▪ Outer Glow - Defines the outer shimmer of objects. The default value is 25. Valid values range from 1 to 100. ▪ Border - Is only available for 2D outlined shapes or 3D unfilled shapes. Defines how thick the outer line [border] of objects is. The default value is 25. Valid values range from 0.01 to 100. ▪ Inner Glow - Defines the inner gleam of objects which are not filled. The default value is 25. Valid values range from 1 to 100. ▪ Proportion - Is only available for Cross and Cross Straight Shapes. Defines the size of arms in relation to the overall size of the Shape. The default value is 37.5. Valid values range from 0.01 to 100. ▪ Diagonals - Is only available for certain Cross and Star Shapes. Defines the length of the diagonal arms in relation to the overall size of the Shape. The default value is 70.7. Valid values range from 0.01 to 100. Position Origin Type - Defines the point of origin of the Shape [and hence its relative position]. Rotation Origin Type - Defines the point of origin of the applied rotation. Interpolation Type - Defines how the Outer Glow will look like [Linear, Ease In Bounce, Ease Out Bounce, Ease In Out Bounce, Ease In Circular, Ease Out Circular, Ease In Out Circular, Ease In Cubic, Ease Out Cubic, Ease In Out Cubic, Ease In Sinusoidal, Ease Out Sinusoidal, Ease In Out Sinusoidal, Ease In Exponential, Ease Out Exponential, Ease In Out Exponential]. The default value is Linear. Interpolation Type - Defines how the Inner Glow will look like [Linear, Ease In Bounce, Ease Out Bounce, Ease In Out Bounce, Ease In Circular, Ease Out Circular, Ease In Out Circular, Ease In Cubic, Ease Out Cubic, Ease In Out Cubic, Ease In Sinusoidal, Ease Out Sinusoidal, Ease In Out Sinusoidal, Ease In Exponential, Ease Out Exponential, Ease In Out Exponential]. The default value is Linear. Shape - Allows you to choose a specific shape for objects. A certain Size is required before a shape becomes visible. The default Shape is Rectangle Outlined. Shape Rotation Type - Is only available for specific Shapes. Defines the angle in which objects are rotated [0°, 90°, 180°, 270°]. Rendering Mode - Defines how objects are rendered. Each mode may enable additional settings [such as additional Shapes]. Choose from 2 different modes. The default setting is Extended.